I’m a huge fan of Uber. But, I also know they take a huge percentage of each fare (I’ve heard from Uber drivers as much as 30%.) However, I also understand websites and technology and the costs to run such businesses, so when I see $1.65 fee on top of an $11 fare – of which Uber gets 20-30%, it makes me click on the link next to the ‘Safe Rides Fee’ line item. 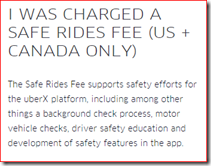 The Safe Rides Fee supports safety efforts for the uberX platform, including among other things a background check process, motor vehicle checks, driver safety education and development of safety features in the app. 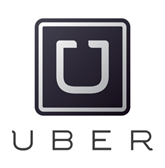 Here’s the issue… As of October 2015, Uber confirmed a $40 BILLION valuation. That’s a lot of money – and I love entrepreneurship and capitalism, but in this case, Uber is just being greedy. That $1.65 for “background checks’ and ‘vehicle checks’ should be coming from the 30% they take from EACH fare that a driver collects. That IS the business that Uber is running. When I see the line item on my phone bill for $1.28 to help extend phone service to rural areas, I get that – it’s basically a tax to help those people who choose not to live near city centers, and it’s an infrastructure cost that will give a return in years to come. And yes, you pay that $1.28 each month on your phone bill. But that’s each month, not each fare. Uber – you’re doin’ a great job (be sure to thank your drivers), but seriously, you need to re-think this fee. Those checks are part of doing this business. If you want to raise fees, do that – don’t try to hide your massive profits in lame excuses in the name of “safety”.